$145 per person. Price includes two curriculum units, lunch, a certi cate of completion, and all workshop materials. Partial scholarships are available for pre-service teachers and schools sending multiple participants. The workshop is appropriate for middle and high school history, social studies and humanities teachers. Our workshops are completely interactive, so be ready to be engaged and inspired! 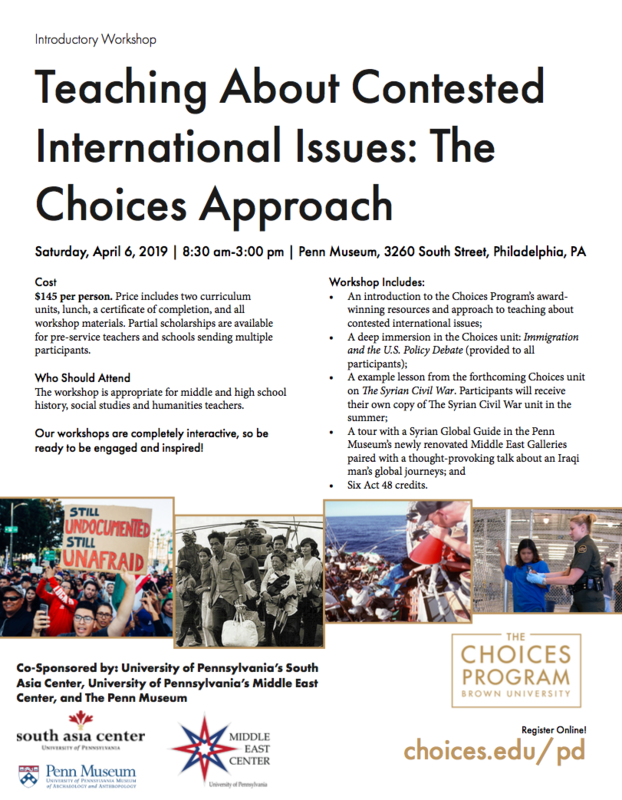 Participants will be immersed in the Immigration and the U.S. Policy Debate unit (provided) and will experience one lesson from the forthcoming Choices unit on The Syrian Civil War. Participants will receive a copy of The Syrian Civil War unit when it is completed in the summer. The workshop includes a Global Guide Tour of the Penn Museum’s Middle East gallery and a presentation by the Penn Museum’s international classroom speaker Yaroub Al-Obaidi.